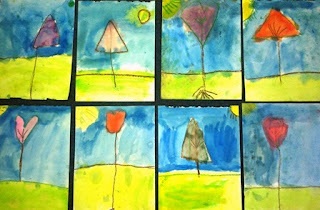 My kindergarten class was studying the environment and in art, they drew/painted three different types of trees. In one week, they used crayon on black paper to draw and colour a stylised tree (pictured above). First, they used a silver crayon to draw the tree trunk, then they drew lines radiating from the trunk. They then filled in the spaces enclosed by the silver lines in crayon. In another week, the children painted a tree at sunset. First, they painted a background in warm colours (red, yellow and orange). They then used a straw to blow diluted black paint over the dry background to form a silhouetted tree. The result is kinda ~spooky~. Lastly, the children used watercolour to paint a shape tree. They first drew in a shape on the top half of the paper. Next, they drew in the stem/trunk and grass/hill. Finally, they used watercolour to paint the picture.